Ten Speed Press, 9781607749486, 272pp. ANUSCHKA REES is a writer and the creator of Into-Mind.com, the go-to online source for all things personal style and minimalism. She has a master's in social psychology from the London School of Economics and has spent years studying the intricacies of human decision making, which she's used to develop her unique system of personal style-defining techniques. "it never hurts to take inventory of what's in your closet already in order to make good decisions when you're staring at a pile of "yeses" in the dressing room. That's where Berlin-based blogger Anuschuka Rees comes in. . . [she] is dedicated to helping women curate their perfect wardrobes using all kinds of handy charts, infographics, and lists that make the process less emotional and more data-oriented." 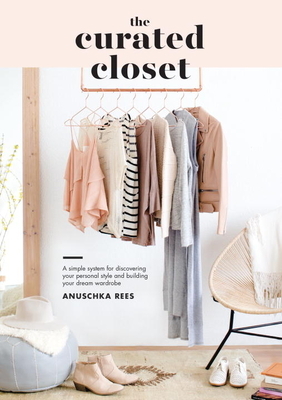 "Fans of the author's blog, Marie Kondo devotees, and anyone who's tired of having a full closet but 'nothing to wear' will treasure this superb resource." "Does your weakness for sales leave you with clothing you’ll never wear? Do you love buying dressy clothes but seldom have an occasion to wear them? Do you have a full closet but still have trouble finding something to wear? Style blogger Anuschka Rees may have a solution for you. In The Curated Closet. . .she outlines how to analyze your wardrobe and lifestyle. She counsels discipline, suggesting you make a list of the items you need and shop with that list in hand, looking for quality and durability." "Lifestyle blogger Rees’s first book, based on the blog Into Mind, is a fun and practical guide to discovering one’s personal style. The goal is for women to easily choose an outfit that they like every single morning, to wear a large portion of clothes from their closet, and to be able to dress for their own lifestyles. Focusing on what one likes to wear and what one does most often, Rees provides a variety of methods to achieve a wardrobe that works. To begin, readers are encouraged to document their own outfits for two weeks (taking a photograph every day), observing their favorite and least favorite looks, colors, fits, and garments. From there, Rees advises readers on how to revitalize their personal style and build a fully wearable wardrobe. The book uses simple but eye-opening graphics to emphasize its points, such as side-by-side pie charts comparing lifestyle to current wardrobe. Refreshing and thorough, Rees delivers a fashion-forward guide that’s awesomely sensible."